Surprisingly enough I’ve made the Monday vase twice in a row, unheard of! Not a bad group of sunflowers, all volunteers from the birdfeeder. 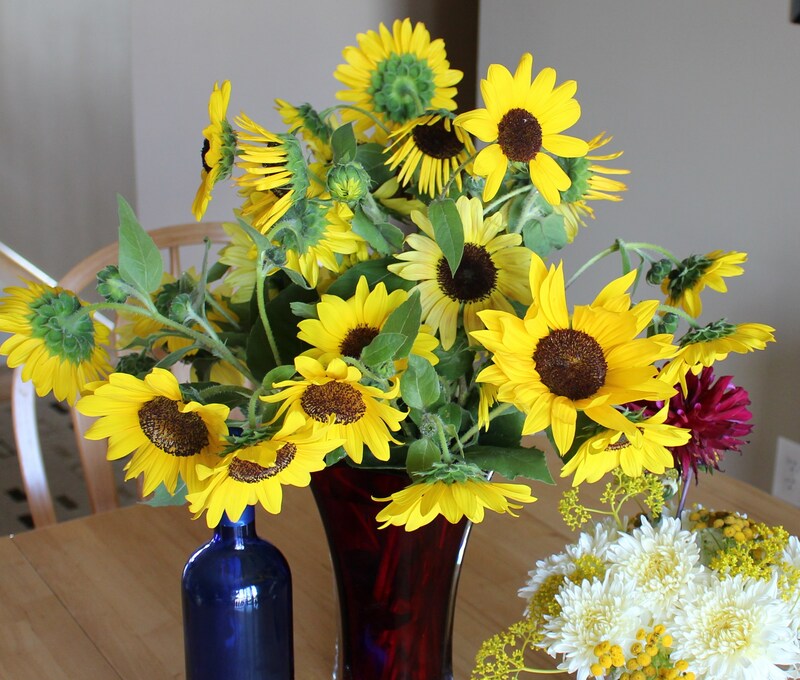 The sunflowers inspired me, and their carefree summer spirit made it easy as pie to put this arrangement together. After they were in place I was told they needed some other vase, and the red didn’t look good, but “don’t push me” is what I said! I added the blue wine bottle, I guess I was feeling very primary with all the sunflower yellow. I didn’t do much fussing over them and I think they look fine, but I noticed this evening they had done a little of their own arranging, and heads were lifted and there was less of the droopy down facing that you see here. It’s kind of like a vase of tulips in that they keep growing and twisting to get into a better position. This should have come as no surprise from a flower that keeps turning its head to face the sun. The birds have been enjoying the seedheads outside for weeks, I guess it’s time for me to enjoy a few myself indoors. You would think a bunch of volunteer sunflowers grown from seed out of the feeder would all just run the range of yellow, yellow, yellow, but there is some variation in these. They’re taller and shorter, branched higher and lower, longer petals, shorter, quilled petals, darker centers, pale yellow, splash of brown, deep golden… it’s quite the surprise. Different colors and sizes, nothing real fancy, but nice surprises none the less. I feel like I splurged in cutting these all for a few days in the house, but I’m sure more will come. The patch still has plenty to look forward to and even a steady stream of goldfinches can’t eat them all. Sunflowers at sunset. They’ve officially taken over. So that’s my Monday vase. I may jump back in here and there to fill a vase, but work is gearing up again and the shorter days really kill my gardening vibe. The vases are fun though and if you’re interested in joining I’m sure Cathy at Rambling in the Garden would be happy to have you. Thanks for hosting Cathy! This entry was posted in annuals, cut flowers, garden design, summer, Uncategorized and tagged cut flowers, flowers, garden, gardening for wildlife, growing birdseed, sunflowers, vase on monday. I often sow black sun flower seeds found in common bird feed mix. They germinate in mid-late summer and give me a great treat of fall yellow flowers. -and I bet a refreshing fall show of yellow flowers is just the thing to reinvigorate you after a long hot summer. 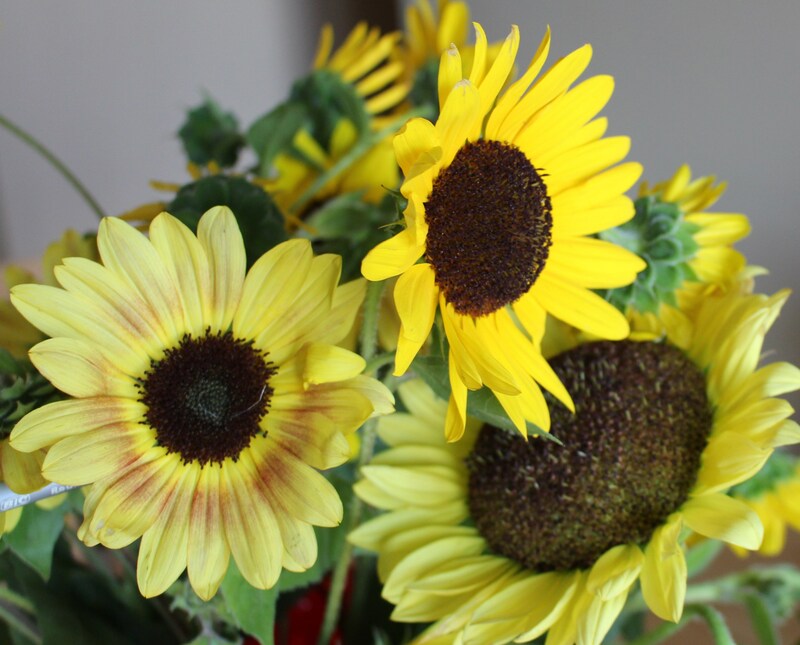 Your sunflower vase looks so cheerful and there are still plenty outdoors. Your garden view looks great. thanks, I may have to cut another bunch since this has been the only cut flower to receive a seal of approval from the boss. the more you cut the more you seem to get with sunflowers so I think you could easily spare these for the vase. They are perfect in a vase somehow, I’ve had a vase in the kitchen for most of the summer. Enjoy! They are a generous flower. The fat grey stripe ones seem to only put out one bloom, but these and the garden sorts seem to keep going and going. Still you do have the advantage of living in sunflower-central, your Umbrian sunflower photos are exceptional! You’ ve done it again! And how lovely it is too. I didn’ t realise that if you picked sunflowers they would keep coming. I do love them but I have never used them in a vase. It is amazing how you get a range of colours from birdseed. I love the evening sun lighting up the border. The sunflowers are gorgeous, how lovely that you let them take over. These seem to keep coming, the large flowered grey-striped seeds usually give plants with only one huge bloom which is also nice, but not quite as effective as a repeating show. I can understand your hesitation at cutting them, but you have got so many in the garden still! And they bring some of the garden indoors – lovely! I adore sunflowers and wish I had more, I think I have to quit relying on the birds and squirrels to plant them. Beautiful. For some reason the birds and squirrels seem to grow the healthiest ones, the ones I plant never seem to do as well. Just recently I’ve had one of them shoot up to 9 feet and put out it’s first bloom. Not only are they pretty, they’ve got some drama to them too! That’s a whole lot of volunteer sunflowers! It’s really lovely, though. I wouldn’t have pulled them out either. The Cosmos in my Monday bouquet lifted up their faces after a couple hours in the water, too, and I had to fight the urge to take new pictures to replace the current pictures in my blog post! Hah! I almost did the same thing, the sunflowers lifted their heads later and I thought it looked much better than the job I did myself…. almost took new pictures, but got distracted of course! I love the term ‘volunteer’ for self-seeders , something I had not heard before blog comments from America! And I am amazed at what you get from your birdseed – we miss out on this by buying sunflower hearts. 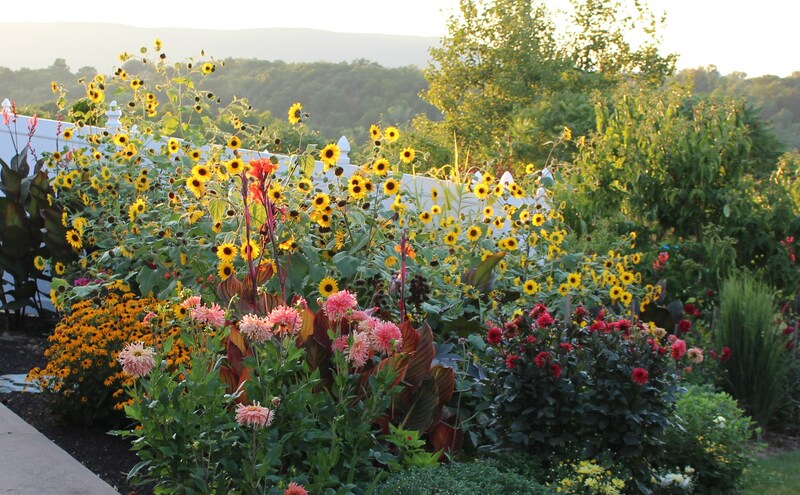 It is wonderful to have a whole vaseful of sunflowers, and I too have learned that cutting will encourage more flowers. I dipped the sunflower head I used last week in boiling water for 20 or 30 secs and it is still going strong – worth thinking about? It was great to see your vase today but I think I must have missed yours from last week – if so, apologies. Perhaps the link was missing then too..? I may try the boiling water trick. the flowers held up well enough but are already fading even with water changes. The term ‘volunteer’ does sound nice for describing self seeders, doesn’t it? Even a borderline weed comes across as someone who just stopped in, hoping to help, rather than someone who elbowed in for a possible takeover bid! But isn’t forgetting I had visited and commented worse than not remembering if I had?! 🙂 ps love the borderline weed analogies! You have quite a crop there. I too get the volunteer sunflowers but it is from the seed I feed my cockatoo, then give the leftovers to the outside birds. Weirdly, they grow better than the seed bought in seed packs. I pulled out about 100 of them, or like you, they would be going crazy in the garden. I like your arrangement and the variation of sunflowers. 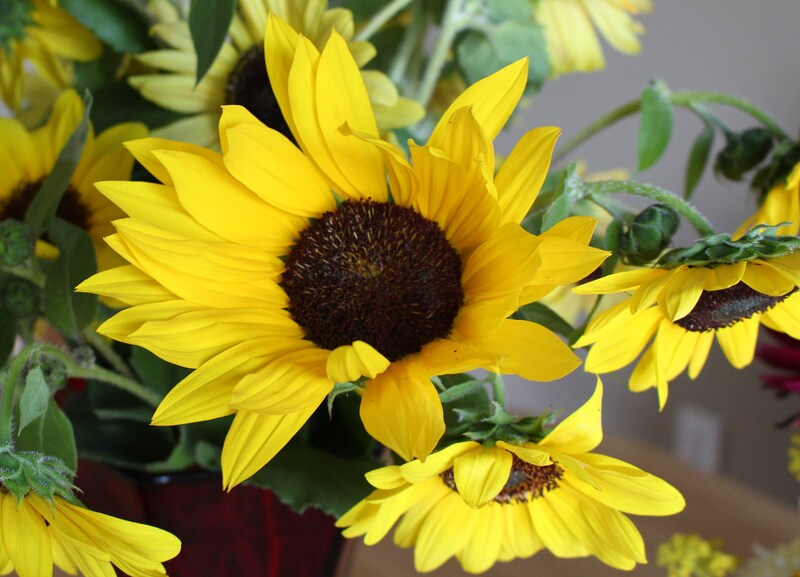 Your vase of volunteer sunflowers is a bright and cheerful display. I wouldn’t have thought of pinching some sunflower seeds from the bird mix … not sure how well that would go down with my husband, he’s the bird feeding monitor in this household. I like the variation in shade of yellow – very pretty. Thanks for sharing. Thanks Elizabeth, and thanks for stopping by. I’m not sure how the birds do it, but all these were seeded out relatively far from the feeder, and they tend to come back in the same spots each year… I guess the birds don’t get every last seed like I thought they did. Your husband might be willing to give up a couple seeds in order to get the early goldfinch show. they’re in and out of the garden all day and it’s quite the entertainment. Sunflowers do make great cut flowers, don’t they? And if you allow some to self-sow, you’ll never be without! I don’t think I could get rid of the sunflowers even if I tried, and I get a kick out of seeing them show up down the street where the street runoff has deposited whatever the birds missed!